A magnitude 6.7 earthquake struck the northeastern Indian state of Manipur. A magnitude 6.7 earthquake struck the northeastern Indian state of Manipur early Monday morning. According to the U.S. Geological Survey, the epicenter of the quake was 29 kilometers northwest of Imphal, the state’s capital. Areas of Bangladesh and Myanmar bordering India also felt strong tremors from the quake. 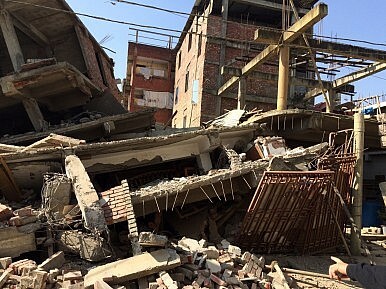 At least nine people were killed—six in India and three in Bangladesh—and 120 were injured as a result of the earthquake, which also caused extensive damage to property and buildings in Imphal and elsewhere in Manipur. Imphal was widely left without power as a result of the earthquake. The Wall Street Journal reports that, according to Maj. Gen. Anurag Gupta of the Indian National Disaster Management Authority, one six-story building had collapsed in Imphal. Images shared on social media, however, show extensive damage to several homes, shops, and other buildings in Imphal. The Imphal airport suffered some damage as a result of the earthquake, but continues to operate. The airport’s continued operation has allowed India’s National Disaster Response Force to quickly ferry aircraft with relief supplies to the area. The Indian government is coordinating its response with chief ministers in the northeastern states, according to the prime minister’s office. Indian Prime Minister Narendra Modi tweeted that he had spoken with state leaders in the area, including Manipur’s Chief Minister Okram Ibobi Singh. According to Modi, Rajnath Singh, the Indian Minister of Home Affairs, arrived in the northeastern state of Assam and is leading the government’s response to the earthquake. Additionally, Kiren Rijiju, India’s minister of state for home affairs, arrived in Imphal to monitor relief efforts. The worst of the damage appears to be concentrated in Manipur. While Bangladesh has suffered some casualties, Myanmar has yet to report the scope of the damage on its side of the border. The areas of Myanmar closest to the epicenter of the quake are sparsely populated.